Do You Want To Be Right? Or Do You Want Peace? Mother Mary asks..."Do you want to be right or do you want peace?" Many have heard this phrase before and it is the message she is delivering most right now. You cant have both during a battle of wills. During current times, those who are finding it difficult to surrender want to argue. Some find themselves pulled into arguments and miscommunications. Stay out of the drama and arguments. Practice compassion and choose your battles wisely. PS Blame isn't the answer either. These are not the times for finding fault. These are times for finding compassion, with boundaries of course. Lots of misjudgments are afoot and if you would like to receive some Rays of Light to bring you back to center, please get in touch. We have 15 minutes pick me up sessions. Feel free to DM me for more info. 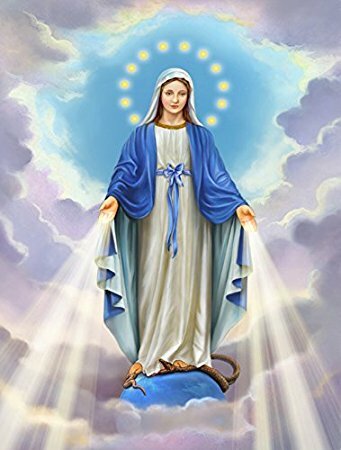 Quick meditation for those wanting to recenter: As you gaze at the Imagine of Mother Mary, see in your mind's eye the Rays of Light coming through Mother Mary's hands like the image above and showering your auric field with white light, cooling your inner nervous system, soothing the mind, and bringing you back to center. This is the 4th Ray of Light. The mind may want to go back to an argument. Try to be the neutral observer that is free of judgement and do not get involved in the thoughts. Just let them pass. Deep breaths. If you find yourself caught up in the argument, go back to step one. Breathe and repeat. There also is a spray infused with this ray called Serenity. You might find it helpful. PS. When you take on the role of neutral observer, you raise above the karma.